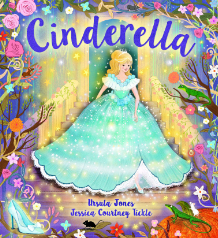 Rediscover the magic of Cinderella and enter a world of enchantment and romance with this exquisite picture book retelling. Award-winning author Ursula Jones breathes new life into this enduring and best-loved fairytale with her characteristic blend of warmth, humour and charm. Paired with dazzlingly intricate illustrations, this is a wonderfully evocative, beautiful and contemporary edition of this timeless classic. This is a modern fairytale with enchanting illustrations by Jessica Courtney-Tickle.